GRAVETTE (KFSM)--It wasn't the smoothest transition for first time head coach Doug Greenwood. "It's been good now that I have a place to stay and am not living on a mattress in my office. It's good to have my family over from Jenks because it makes things easier," Greenwood said. The former defensive coordinator for Oklahoma power Tulsa Jenks enters his first head coaching job with an attitude of energetic leadership. "My style is building on the foundation that was already here. We want to be servant leaders, it's about giving back to the community," said the head coach. "So learning from a great man in [Jenks coach] Allan Trimble, I want to build a culture of character." "I think he's been a great coach so far and a great leader," Tajae White said. "He came from a great program so hopefully we can build that tradition here." Greenwood took over in May and has been building relationships with his team ever since. "Man when he got in here, the hype level went through the roof," senior Colton Grimes said. "Everything got picked up, I mean more intensity, more effort. He was in the weight room with us banging music, banging the weight racks, getting down with us." "You can't change who you are," Greenwood added. "I'm a little bit intense, I'm not very passive." The first time head coach inherits a situation with every offensive lineman back and a bunch of senior leadership. "I was able to meet with Coach Harrelson his last day on the job and he told me things to look out for and what to expect," Greenwood said. 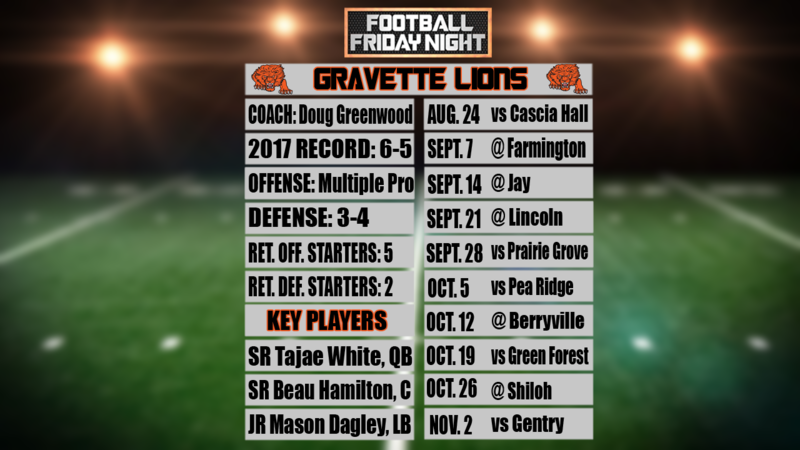 Gravette begins the season hosting Oklahoma school Cascia Hall in week zero on August 24.